Texas NORML is the Austin chapter of the National Organization for the Reform of Marijuana Laws. We are a trans-partisan, educational 501c4 nonprofit. We have proven our ability to organize, endure and succeed. 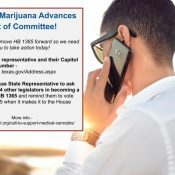 Take part in changing Cannabis Laws in Texas! Texas Norml is active in the community. We hold open meetings at 8:00pm every first wednesday at The Flamingo Cantina, 515 E 6th street in Austin, Texas! Here's what's going on with our chapter! With our lawmakers meeting for only 140 days every two years, we have a lot of work to do in a short period of time. 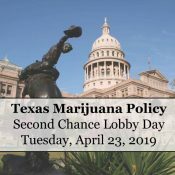 Your participation is critical to changing laws relating to marijuana in Texas.Our Texas Marijuana Policy Lobby Day is a participatory event where we, the people, will engage our legislators and their staff. 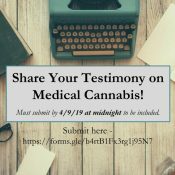 bringing seriously ill patients safe and legal access to medical cannabis. All materials will be provided as well as a legislative briefing and advocacy training for those who have never visited the Capitol. Join us for an afternoon of direct action at the Texas Capitol. We'll be delivering fliers to the offices of state legislators, which will take approximately one hour with enough people helping. It's a simple action that goes a long way to ensuring that this important issue is at the forefront of our lawmakers' minds. Attire: Professional or business casual. Please meet us in the Capitol Reference Library which is located just outside of the elevators on Level 2. Entrance is off E 12th St. or E 13th St. Parking is free for the first 2 hours and $1.00 for each half hour thereafter. oin us for an afternoon of direct action at the Texas Capitol. We'll be delivering fliers to the offices of state legislators, which will take approximately one hour with enough people helping. It's a simple action that goes a long way to ensuring that this important issue is at the forefront of our lawmakers' minds. We hope you'll join us for the FREE open monthly meeting taking place the FIRST Wednesday of EVERY month, at 8 pm at Flamingo Cantina, 515 East 6th Street, Austin, TX 78701. We'll have a list of upcoming events that Texas NORML will be involved in, updates on some of our events this past month as well as the latest news from around Texas and the US about cannabis law reform. Immediately following the meeting and comedy, there will be free live Reggae music brought to you by the always amazing Mau Mau Chaplains! We hope to see you all soon! Come on out and get involved so we can change the laws here in Texas and make some new friends while doing it! Upcoming Opportunities to Take Action in Austin! 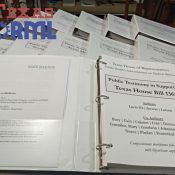 Texas House Bill 1365 has been scheduled for a hearing! Donate to NORML of Texas to help us achieve responsible legalization for medical and adult use for those who need it. We need people! Join our chapter and become apart of the right side of history, bringing new medicines and responsible adult use to life in America.